Measure across the fullest point of your bust (1) and measure under the bust (2). IMPORTANT! Bras are very stretchy and you will fit even to smaller underbust size bra. But it will squeeze a bit and will start to feel uncomfortable when wearing it for long periods of time. However, if you only play at home for a couple of hours then there is no problem when you cannot find matching size. In most cases, Band size 80/36+ is acceptable for an adult sissy male. 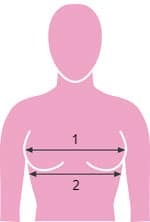 example: Bust (39′) – Underbust (32′) = 7′ is the difference. You could choose cup size D (Large) and Band size 38. So in that example, you should buy 38D/85D. All sizes in the store are US Woman sizes.